Crow Canyon Software announces Gold Sponsorship of the North American Collaboration Summit, to be held March 2 and 3 in Branson, Missouri. The conference, formerly known as SharePointalooza, focuses on how SharePoint and Office 365 can be used to drive digital transformation at organizations of all sizes. With leading experts and speakers delivering presentations, the two-day conference will help delegates make sound decisions and understand the collaboration landscape in terms of the SharePoint and Office 365 platforms. The more than 50 sessions will cover a wide-range of topics with tracks for Developers, IT Pro’s, Information Workers, Business Users, and Special Interest. 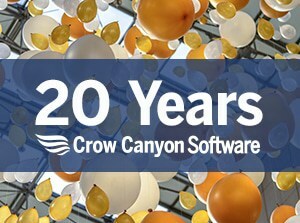 During the two-day conference, Crow Canyon Software, along with other vendors, will showcase its products and services in the Expo Hall. The Summit will be held at the Branson Convention Center in picturesque Branson, Missouri, on Friday, March 2nd, and Saturday, March 3rd. It is a community-driven event with a low cost of only $65 to attend (students and military are free). The conference will be preceded by full-day workshops on March 1st. These workshops are at an extra cost and cover topics such as PowerBI, Azure, Office 365, and Microsoft Teams. In addition, an Attendee Party with live music will take place on Friday night.